Cragmatic Pope was a band that was part of the late 90s punk scene in northern Ontario Canada. CRAgmatic Pope, sometimes abbreviated as CRAP, was started in 1994 with mostly different line-up. 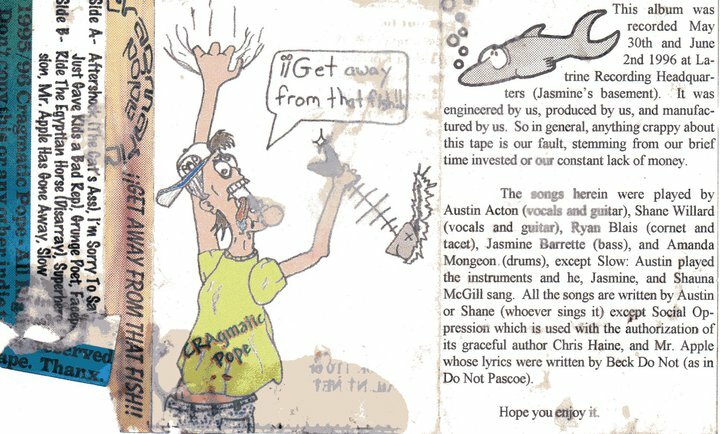 The line-up of Cragmatic Pope represented here recorded "Disappear Today" in a small 8-track basement studio in 1995 for $600, and "Get Away From That Fish" which was produced by Austin on a 4-track in Jasmine's basement in 1996. Roughly 50 copies of "Disappear Today", and 125 copies of "Get Away From That Fish" were pressed. Austin, Jasmine and Ryan would later form a band called Groundstate which would record an EP titled "Amphetamine" in 1997. Shane would go on to form The Deefons. From Disappear Today released in a bubble in 1995, released on the web in 2009. Featured on Ronnie Rodent's Best of the Noughties part 3 on Radio Xanadu in the UK. I wrote this song singing in the shower when I was 16 years old back in 1995.It's about a lonely boy who finds a jellybean on the ground and becomes its best friend. I was a weird kid. The Deefons Where I went. Shane Willard Where I am.